Aircraft refueler/ defuelers can be either a self-contained fuel truck or a fuel cart. Fuel trucks are self-contained, typically containing up to 10,000 US gallons of fuel and have their own pumps, filters, hoses, and other equipment. Fuel trucks typically deliver the fuel to the aircraft. A fuel cart generally hooks into a central pipeline network and provides fuel to the aircraft. Skybus LLC/ Global GSE stocks a variety of aircraft refueler/ defueler units. If you do not see what you need here, please contact us as we have new stock arriving weekly. 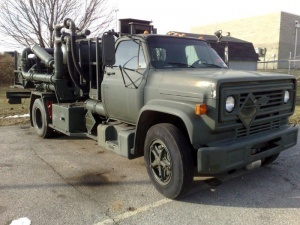 The Tri-State Aircraft Refueler/ Defueler Pump Truck is built on a 1987 Chevrolet truck frame. The truck is powered by a GM 8.2 - litre diesel V-8 engine. It also has an automatic transmission, air brakes, 35,183 miles, and 1053 hours on the pumping unit. The International Kovatch KM10 Jet Aircraft Refueler/ Defueler Truck has an International 6-Cylinder Turbo Diesel Engine, and an Automatic Transmission. The tanker has a 5,000 gallon Jet A1 fuel capacity. A new coat of paint has also been applied.